We Sony NEX camera owners don’t have tons of lens choices until you look at some of the options for adaptors. The Metabone’s Speed Booster is a pretty amazing device. It adapts Canon EF lenses to Sony AND increases your maximum aperture by 1 stop (hence its name). It also preserves the focal length of full-frame lenses on APS-C cameras like the Sony NEX series. For a long time, shooters with APS-C size sensors in their cameras have been seeing longer focal lengths than what is inscribed on the lens. A 35mm lens turns out to be 56mm (if the crop factor is 1.6x), a 24mm lens turns out to be roughly 38mm, and so on. Your field of view shrinks because the sensor is smaller. Metabone’s Speed Booster has a focal length multiplier of 0.71x. So for example, the Canon EF 85mm f/1.2L II lens becomes a 59mm f/0.9 lens on a Sony NEX camera, with increased sharpness. The faster F-stop allows for shallow depth-of-field and a lower ISO setting for decreased noise. Using the Metabones Speed Booster, the image is focused onto a smaller area, and the entire field of view is preserved as if you were using a full-frame camera. Because the image is focused smaller, the light passing through becomes intensified, and that means your lens will receive about 1 stop of extra brightness. Like magic, your f/1.8 lens becomes an f/1.2 lens. It is pricey, but everyone I know who owns one loves this device. 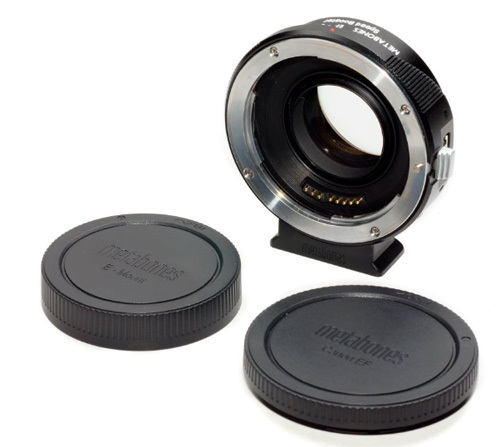 Check out the Metabones Speed Booster . A speedbooster is a must when is used a 4/3 senzor. The increased image coverage and speed of the lens makes a small camera act like a proffesional one.